Sift the flour into a bowl with a pinch of salt. Add the butter and rub into the flour until the mixture looks like damp crumbs. You can do this in a processor - return the mix to a bowl before continuing. Add 2-3 tbsp cold water, just enough to make a pliable dough. Knead lightly into a ball, wrap in clingfilm and chill for 30 minutes. 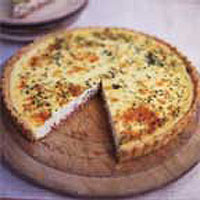 Roll out the pastry and use to line a 20cm-diameter, 4cm-deep flan tin, with a removable base. Keep any offcuts. Prick the base with a fork, cover with foil, fill with baking beans and bake for 10 minutes. Remove the foil and beans. Bake for 10 minutes more. Reduce the oven to 170°C/gas 3. Meanwhile, heat the oil in a frying pan over a medium heat and fry the pancetta or bacon until very crisp. Transfer to kitchen paper to drain. Separate four of the eggs. Whisk together four yolks and three whole eggs. Stir in the crème fraîche and chives. Season with salt, pepper and lots of nutmeg. Plug any cracks in the pastry case with pastry offcuts. Beat one egg white and paint thinly over the pastry to seal. (Discard the other whites). Strew the bacon over the pastry, pour over the egg mixture and cook for 30-40 minutes until just set. Serve hot, warm or cold.